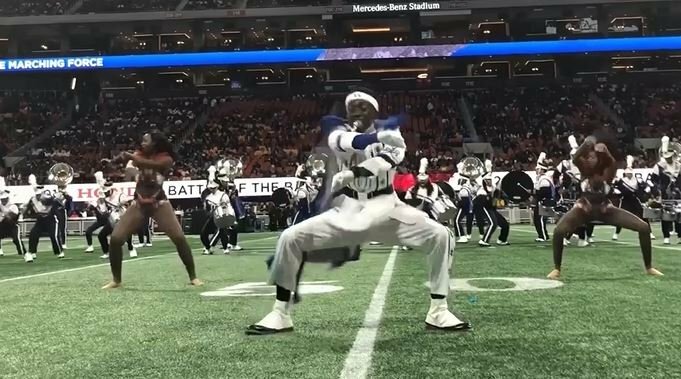 ATLANTA (AP) — Five drum majors approach midfield and snap into high-stepping formation, capes swirling as they spin and drop into splits before hopping up and bending backward until their hats scrape the ground. When they dart toward the sideline, Bethune-Cookman University’s 300-piece marching band and its 14 Karat Gold Dancers surge onto the field, performing Mary J. Blige’s 2007 hit “Just Fine” for a crowd of more than 62,000 at the 16th annual Honda Battle of the Bands Invitational Showcase in Atlanta. Florida A&M’s Marching 100 performed with Prince for his spectacular Super Bowl halftime show in 2007. Southern University’s Dancing Dolls squad accompanied Madonna at Super Bowl 46 and Beyoncé at her 2013 halftime show. Southern, FAMU and Grambling State have performed at 12 Super Bowls in all. “I think the marriage between the pop and music world will continue to show how great the marching band culture is at black colleges,” said Keith, whose son is a drum major for Tennessee State’s Aristocrat of Bands. Even presidents have taken note. Miles College’s Purple Marching Machine played at a campaign rally for President Bill Clinton in 1996 and Arkansas at Pine Bluff’s Marching Musical Machine marched at President Barack Obama’s 2009 inauguration parade. In film, Clark Atlanta’s Mighty Marching Panther Band and Morris Brown College’s Marching Wolverines appeared in the “Drumline” movies, which center on HBCU bands. Morgan State’s Magnificent Marching Machine was in the 2003 film “Head of the State,” starring Chris Rock, and Alabama State’s marching band performed in 2016′s “Billy Lynn’s Long Halftime Walk” and starred in their own reality television series, “Bama State Style,” last year. Actor Samuel L. Jackson posted several videos of Battle of the Bands performances on Instagram, garnering nearly 400,000 views. Alabama State’s Oliver says that kind of publicity could change things.